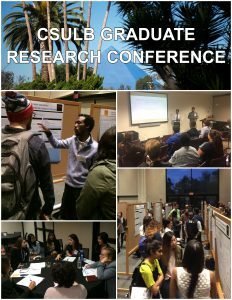 The Graduate Studies Resource Center at Cal State Long Beach runs an annual Graduate Research Conference each fall semester. The conference offers graduate students in the Liberal Arts a chance to present research in various stages of development; additionally, students gain experience interacting with other graduate students and faculty in an academic conference setting. The conference format includes panel presentations, poster sessions, round-table discussions, and a keynote presentation. The 2nd annual Graduate Research Conference will be held in the USU Ballroom on November 13th 2017, from 4:00pm–7:00pm. All members of the College of the Liberal Arts are invited to participate and attend. Call for proposals will be made available on August 15th 2017. For more information, please visit the Graduate Studies Resource Center website.